How are Healthcare & Retail Marketing Alike? Healthcare is moving toward a more de-centralized focus. Just like retail, healthcare now includes more stand-alone and strip-mall type locations and facilities. However, when it comes to marketing, most healthcare hasn’t shifted towards the retail strategy. So we went ahead and changed that for our clients. In order to stay competitive in retail, you must be better than the retail around you. The object is to gain more attention than the surrounding retailers. That is where a window cling, or adhesive mesh vinyl, comes into play. What exactly is an adhesive mesh vinyl (we’ll call them vinyls for short)? In technical terms it is a vinyl image that you can place and display over a window pane. In marketing terms, a vinyl is your sales message. It’s what is going to separate you from the surrounding competitors. Before you assume that a vinyl is just a glorified poster or wall sticker, there are some major differences that you should know. First, a quality vinyl, like the ones we use for our clients, generally last for 2 years. That is not your average sticker that peels away in a couple of weeks. For two years you will have a cost-effective advertising option that boasts a strong graphic presence. Another really unique thing about these vinyls is their transparent properties. The material used is such that you can see outside of the building (through the vinyl) while inside. The vinyl allows sunlight in and an unobstructed view of the outside. When looking in from the outside, the vinyl is primarily opaque. Below you can see an example of what the adhesive mesh vinyl would look like displayed on a building. I’m curious, though, because while certain aspects of healthcare are becoming more retail, it seems like the majority of healthcare retail-oriented purchases aren’t impulse buys. 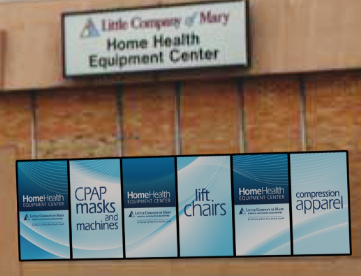 The example you show of a home care/DME store with the vinyls seems to be promoting things you wouldn’t necessarily see a sign for and come in,like CPAPs, wheel chairs and pulse oxymeters. I think in an age of dwindling insurance coverage, much of this type of stuff would be price shopped. Now, i can definitely see putting a Flu Shot vinyl on an urgent care center!